Libertyville, IL - On Saturday, February 19, 2011, His Holiness Serbian Patriarch IRINEJ served a Memorial Liturgy for the repose of Metropolitan Christopher of blessed memory at St. Sava Monastery in Libertyville, Illinois. Serving with His Holiness were His Grace Bishop Longin of New Gracanica and Midwestern America and His Grace Bishop Maxim of Western America, as well as eleven other clergymen, including: Archimandrites Thomas (Kazich) and Zacchaeus (Wood-OCA), Archpriest-Stavrophor Nedeljko Lunich, Archpriest Vasyl Kuzmych (ROCOR), Priests Jovan Jovich and Darko Spasojevic, Protodeacon Stanimir Spasovic, Deacons Damjan Bozic, Aleksandar Petrovic, Predrag Samardzic and Nikolaj Kostur. 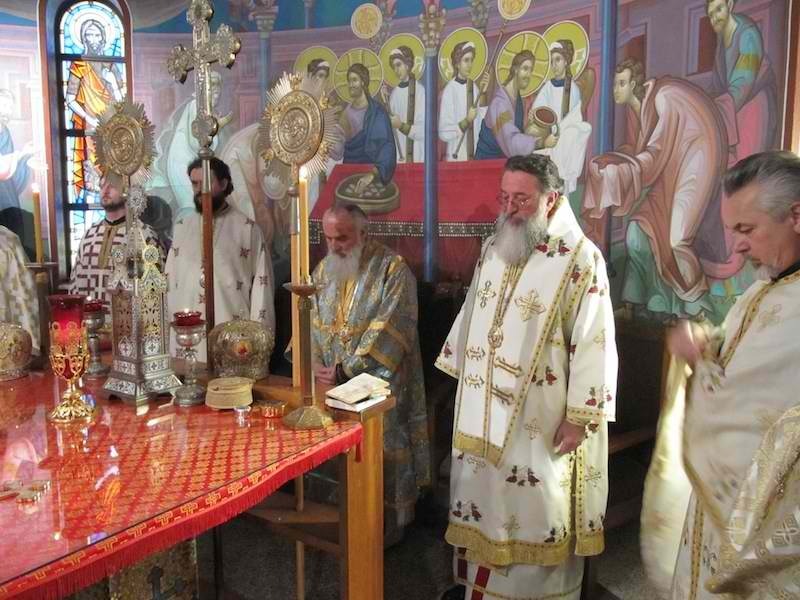 Following the Divine Liturgy, a Memorial Service (Parastos) was served for Metropolitan Christopher of blessed memory. His Holiness addressed the faithful present with warm words. The Patriarch stated that it was his intention to be present at the funeral of Metropolitan Christopher, but since he could not get a visa in time, he was not able to attend. Therefore, he made a promise to come for the Six-Month Parastos for Metropolitan Christopher. His Holiness spoke of the good deeds and efforts of Metropolitan Christopher during his tenure as a hierarch of the Serbian Orthodox Church on the North American continent, stating that Metropolitan Christopher sincerely strove to keep a connection with the Fatherland and America and always worked for church unity in North America, a goal that should be each of ours as Serbian Orthodox Christians. After the Parastos, the Patriarch served a Pomen (Short Memorial Service) at the graves of Metropolitan Christopher, Bishop Firmilian and Bishop Dionisije. A memorial luncheon was prepared in the Monastery Hall for all present by the Women’s Auxilliary Organization of St. Sava Monastery. In the evening hours, His Holiness visited New Gracanica Monastery, where he attended a folklore festival with several hundred dancers plus parents and visitors in attendance. The Patriarch was overjoyed with the amount of youth and people present at the event. He greeted all present with kind words of support and encouragement, reiterating the importance of preserving our Serbian cultural and language, so that future generations in North America and in all other countries of the Diaspora never forget their heritage.